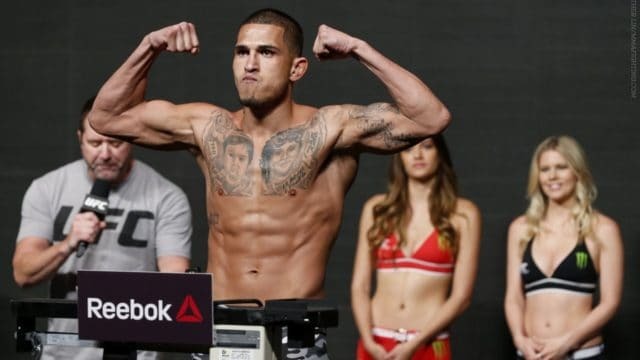 Anthony Pettis is set to make his welterweight debut. “It’s definitely not a one-off,” Pettis said. “This is just me trying out that division. I’ve been inactive in my career. This is a point where I want to be active. Thompson hasn’t fought since May of last year when he suffered a unanimous decision defeat to Darren Till in England. Now he’ll face Pettis, who was one-half of an epic co-main event at UFC 229 in October. Pettis fought Tony Ferguson in a bloody lightweight collision, that ended after the former champ was unable to get off the stool for the third round due to a broken hand. Now, he’ll attempt to skyrocket into the top ranks of welterweight with a possible victory over Thompson. “I want big fights,” Pettis said. “I want (Jose) Aldo. I want everybody that I should have fought a long time ago. I’m not waiting for anything this year. I’m just going out and having fun.